Understanding Late Cretaceous climate should inform debate about future climate trends and variability under greenhouse conditions. Tiny organisms preserved in marine sediments hold clues about Arctic climate variation during an ancient episode of greenhouse warming. Based on reconstructions of Arctic climate variability in the greenhouse world of the Late Cretaceous, Southampton scientists have concluded that man-made global warming probably would not greatly change the climatic influence associated with natural modes of inter-annual climate variability such as the El Niño – Southern Oscillation (ENSO) or the Arctic Oscillation/ North Atlantic Oscillation (AO/ NAO). It is anticipated that the Arctic Ocean will become ice free during the summer within the next 15–50 years as a result of global warming. Because sea ice is reflective, its loss will reduce the amount of the Sun’s energy bounced back out to space, thereby amplifying regional warming. However, changes in atmospheric circulation could also occur, making it difficult to unravel the likely net effect on climate. “A key question is how an Arctic without permanent ice cover will affect atmospheric circulation and climate variability, particularly over high and mid latitudes,” said Kemp. One way of addressing this issue is to look back at previous greenhouse episodes in Earth’s history. For example, Kemp’s group has previously reported in the journal Nature that during the Late Cretaceous, when the dinosaurs roamed the world, the Arctic Ocean was free of ice in summer with only intermittent sea ice in the winter. “Understanding Late Cretaceous climate should inform debate about future climate trends and variability under greenhouse conditions,” said Kemp, whose team’s new findings are published in Geophysical Research Letters. In both studies, Kemp and his collaborators analysed sediment cores from a marine ridge in the Arctic Ocean. These sediments date to the Late Cretaceous (69–76 million years ago) and contain fossil remains of diatoms, an important group of phytoplankton – tiny planktonic marine plants. The sediments contain alternating band-like laminae of two types, representing diatom growth conditions in the Arctic spring and summer, respectively. Each year is represented by a couplet of laminae, one of each type, which allowed the researchers to reconstruct ocean conditions at annual resolution. 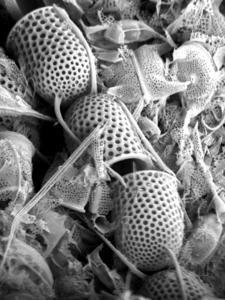 “The presence of diatom laminae testify to ice-free Arctic summers during the Late Cretaceous, although there is also evidence of ice rafting by intermittent winter ice,” said Kemp. The researchers analysed two sections of sediment core covering between them a continuous period of around 1,000 years. By analysing the characteristics of the diatom laminae and measuring their thickness they were able to reconstruct climate-driven variation in ocean conditions both between years and over decades. Their analyses revealed that the Arctic climate of the Late Cretaceous varied over various timescales with periodicities closely matching those observed in the modern Arctic. It therefore appears that the Arctic was subject to some of the same climatic influences in the Late Cretaceous as it is today, including ENSO, which periodically transmits equatorial influences to high-latitudes via ocean-atmosphere interactions. “A modern Arctic lacking permanent sea ice should be subject to similar influences as it was under greenhouse conditions in the Late Cretaceous,” said Kemp. This is important because there has been an ongoing debate about whether natural modes of climate variability such as ENSO and AO/ NAO would be perturbed or enhanced by global warming caused by greenhouse gas emissions. Particular controversy has surrounded whether such warming could cause a permanent El Niño state or milder European winters. “Based on our findings, it seems unlikely that man-made global warming would cause a permanent El Niño state,” concluded Kemp. The researchers are Andrew Davies, Alan Kemp, and Heiko Pälike of the University of Southampton’s School of Ocean and Earth Science based at the National Oceanography Centre, Southampton.